A Class B RV is smaller than Class A RVs, yet are just as loaded with all the comforts of home. These are 16 to 20 feet (and longer) in length. They are sometimes called conversion vans because they have been modified to be a brother to the Class A RVs. They have some of the same features just in a smaller compact size. These vans can also be used as a regular everyday vehicle. You will find them amongst the most used of families that travel. 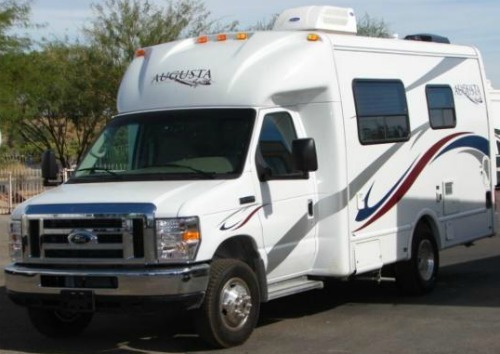 Easier on gas mileage makes this type of motor home the most sought after. There are so many different striping patterns and colors to choose from. You can have one custom made or just find one on a dealer lot to choose from. The features are easy to use and you don't have as many buttons and knobs to know how to use. Just get in, drive and go anywhere you want to go. You will surely enjoy the ride and the drive. With ease of parking and maneuverability, you can park them just about anywhere and have all the comforts of a larger type motorhome. You will be amazed at the features found in them. Most include a toilet, water heater, furnace, shower, functional kitchen and a generator to keep everything working. With everything self-contained, this is the most practical of family traveling motorhomes. You will see them all across the U.S.A. Highways and Biways if you travel a lot. Most of them are used for small families or just a couple of people. Either way, they are popular and economical to use. The spacing inside these motorhomes is not as much as the Type A's, but you will love the better "get aroundability" of it. The storage space is limited and does not work as well for traveling on long trips. You can, however, feel comfortable as the sleeping areas can accomodate up to four easliy. If you are like us, you can probably sleep more by how you lay out the arrangements. The price of a Class B RV are considerably lower than Class A's, being in the price range of $30,000 to well over $75,000. If you are looking for a great way to travel, get good gas mileage, easy to drive motorhome, this is your best way to go. Least expensive motorized RV to own and operate. Can tow a small trailer or support a carrying platform on hitch. Can reach less accessible camping sites that are too tight for large RV's. Limited space practical only for short trips.